and fun facts "always" found in "Magic Tree House" books. House whisks Jack and Annie back to a ghost town in the Wild West of the 1880s. The saga and success of "The Magic Tree House continues! The tenth adventure, "Ghost Town at Sundown, is filled with the excitement, action, and fun facts "always found in "Magic Tree House books. Morgan le Fay has promised to make Jack and Annie masters of the tree house if they can solve four riddles. 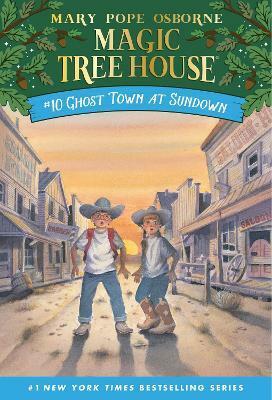 In "Ghost Town at Sundown, the Magic Tree House whisks Jack and Annie back to a ghost town in the Wild West of the 1880s. There, they meet a mustang herder named Slim as they search for the answer to the second riddle.